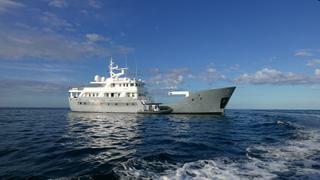 The 42 metre explorer yacht Anda has been listed for sale by Joachim Howard at Ocean Alliance in Australia. Anda was built in steel by Norwegian yard Brodrene Lothe and delivered in 1965 as an ice breaker. In 2014 she was completely rebuilt as a luxury explorer yacht under the direction of designers Ocean Gecko. Honey-toned woods are paired with neutral soft furnishings, creating a warm interior accommodating 10 guests in five cabins configured as a master suite, three doubles and a twin. All guest cabins have entertainment centres, television screens and en suite bathroom facilities while the crew quarters sleep 11 members of staff aboard this yacht for sale. The main saloon offers plush seating, coffee tables and a full entertainment centre, perfect for relaxing and socializing. Separate and forward is the formal dining area, where high- backed chairs are grouped around the bespoke and stylish formal dining table. The lounge area boasts large panoramic windows to port and starboard, while the dining area features 270-degree wrap around windows, ensuring both spaces offer ample natural light. Outdoors, the upper deck is the perfect area to enjoy al fresco living at its finest, offering a complete wet bar with seating, a dining option and an array of sun pads. Her top speed is 11.5 knots and she boasts a maximum cruising range of 6,000 nautical miles at 10 knots with power coming from a 500hp Wichmann 5ACA diesel engine. Lying in Western Australia, Anda is asking $4,400,000.